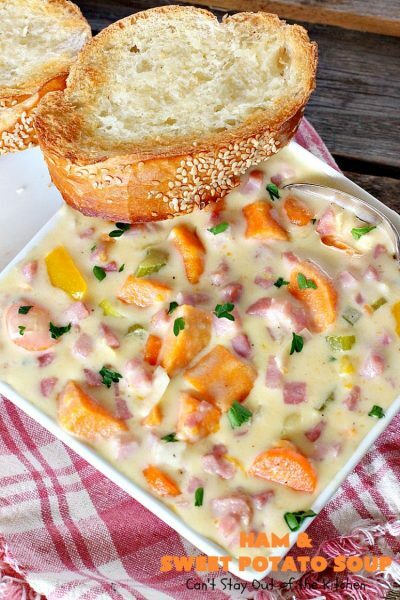 Oh, I just love this soup! 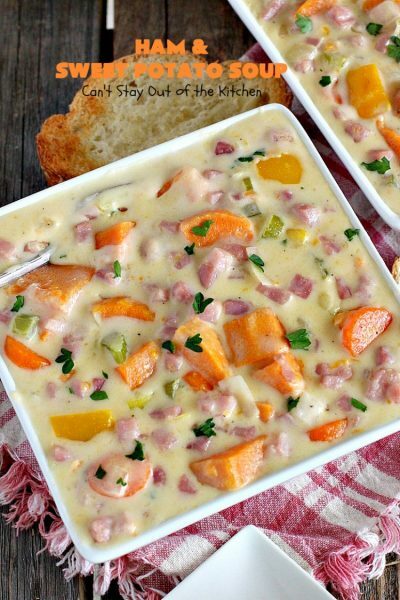 Ham and Sweet Potato Soup has lots of delicious leftover spiral-cut ham, sweet potatoes, onions, leeks, carrots and celery in a wonderful cheese sauce that’s so satisfying to the taste buds. 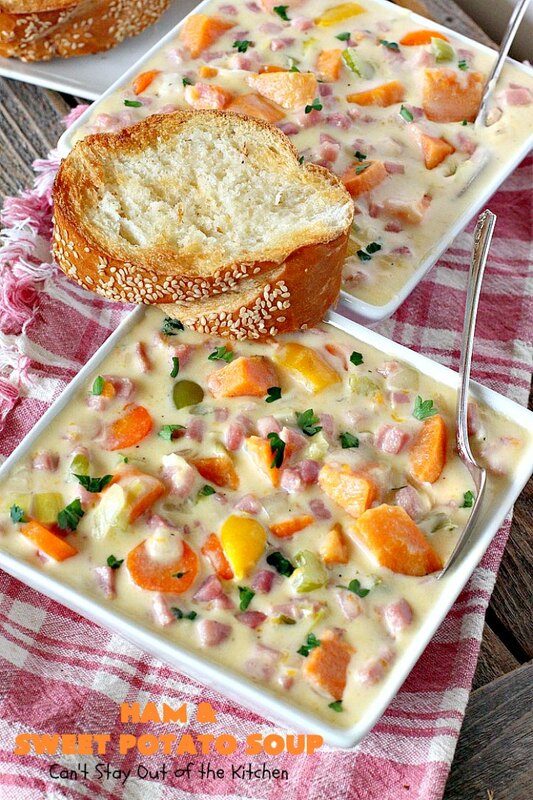 Soups are becoming my comfort food of choice (second only to salads), and this one in particular is wonderful. I started with a family favorite: Canadian Cheese Soup and switched out sweet potatoes for the regular potatoes and added a few other ingredients. 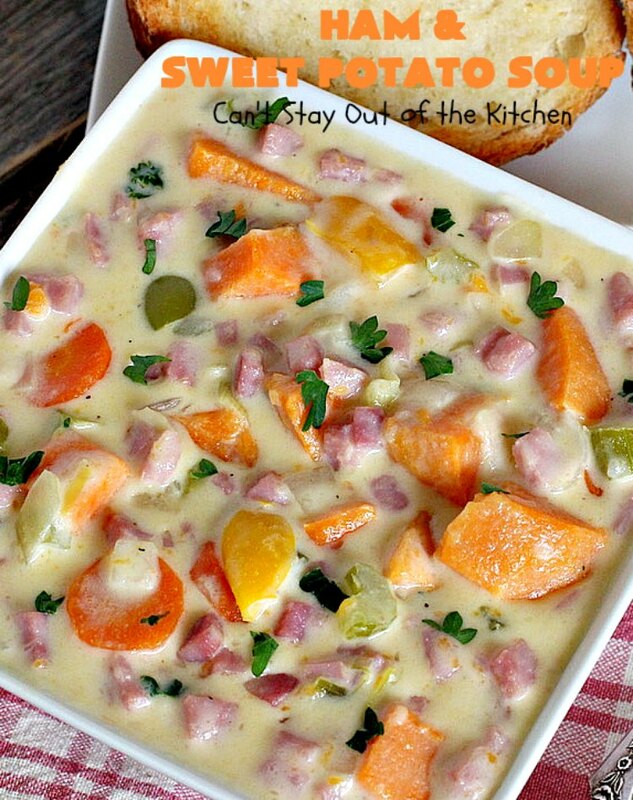 This tasty recipe is also gluten free for those on gluten free diets. 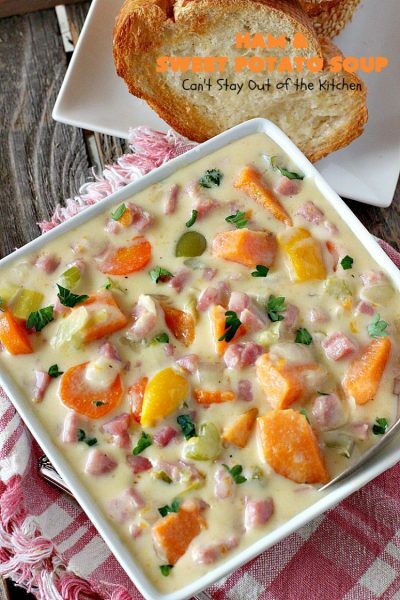 If you enjoy ham, cheese and sweet potatoes you are sure to be delighted with this amazing soup. I was pulling some old food containers out of my freezer the other day to clean it out and remembered I’d put some leftover ham in it from a few months back. 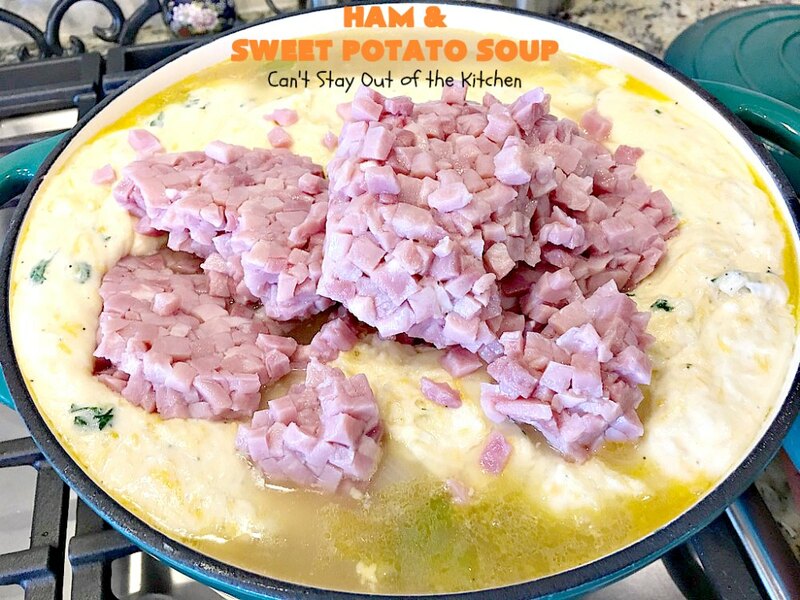 I was trying to figure out ways to use the ham without a lot of pasta or canned soups when I remembered this great recipe. After making all the substitutions it turned out as well, if not better, than my Canadian Cheese Soup recipe, and that’s one fantastic soup. I suppose it’s because I love sweet potatoes so much. 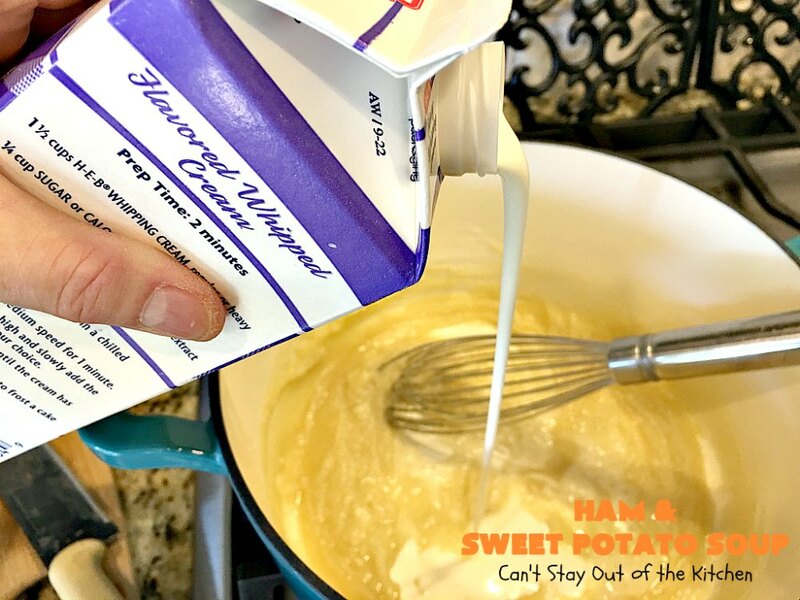 Plus, it doesn’t hurt to have a quart of half-and-half or heavy cream and a pound of cheese in the recipe! Granted, that’s a lot of dairy, but it does make about 10 large servings. Normally, I would have used only about two cups of ham, but after cutting up what was left over it measured just over four cups. 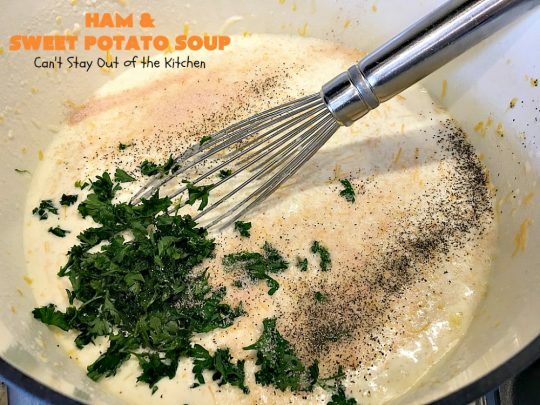 I decided to use all of it since my husband likes a LOT of meat in his soups, salads or casseroles and, I didn’t want to refreeze the ham or think of something else to do with it. 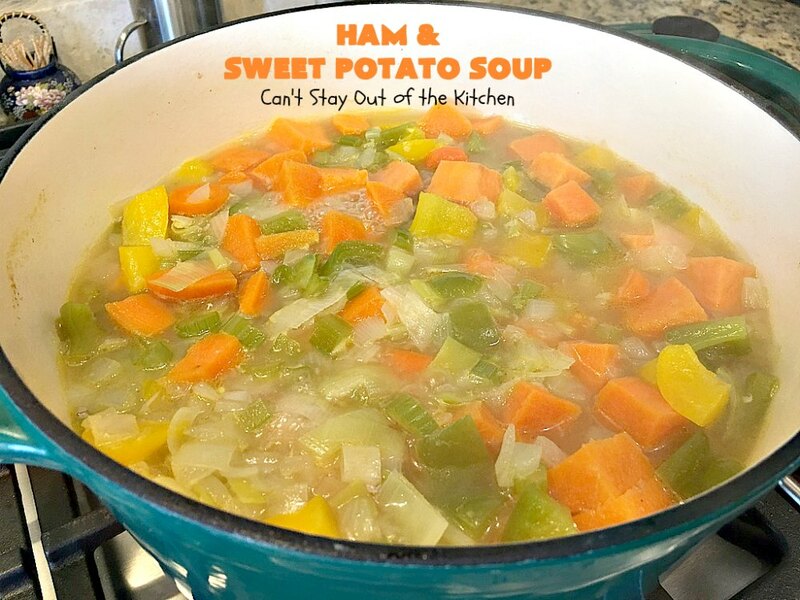 This meat soup is so hearty and filling, has lots of texture and taste, and really doesn’t take all that long to prepare if you have cooked ham on hand. When I initially posted this recipe in July 2014 I loved the soup but I was really unhappy with my pictures. I used a vegetable broth so the soup ended up looking brownish rather than the cheesy look it’s supposed to have. 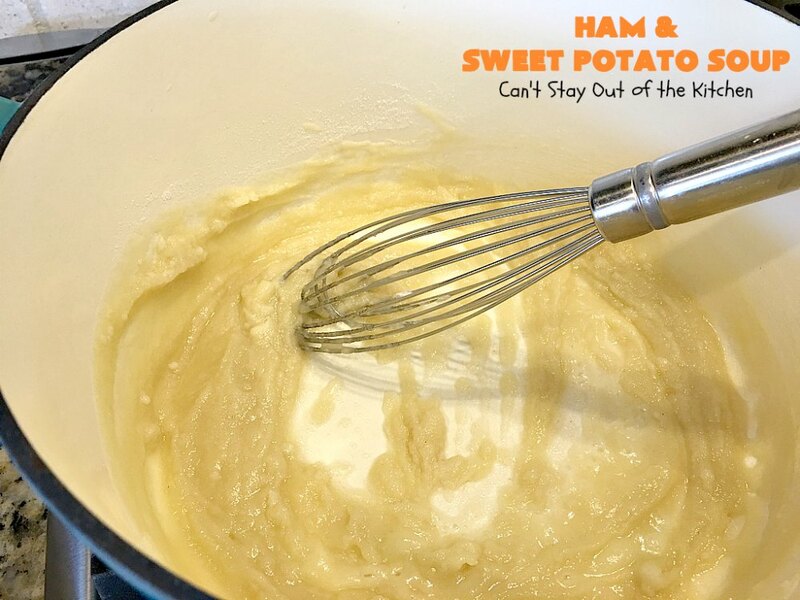 I decided to remake this recipe (January 2018) for our Friday night care group. This time I used a homemade chicken broth which is much clearer in color than vegetable broth. (Regular chicken broth is also fine). 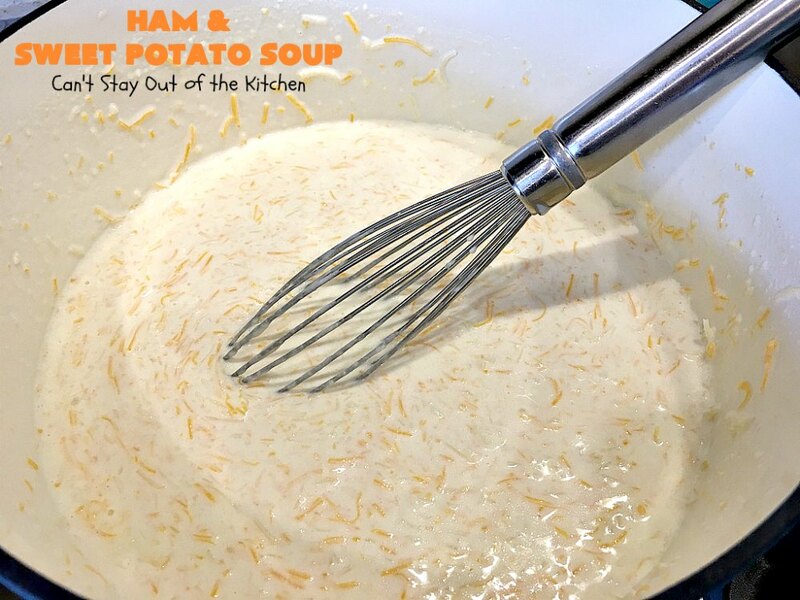 Ham and Sweet Potato Soup has a smooth cheese flavor and is a great comfort food. 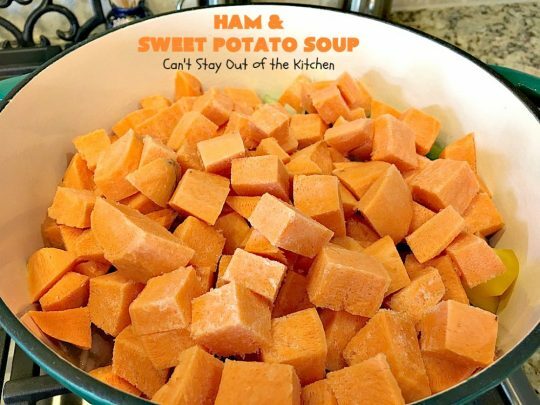 Ham and sweet potatoes go so well together. Then add half-and-half and cheese and WOW! Flavor explosion. I used these ingredients. While I used a homemade chicken stock, pre-purchased chicken broth is also fine. Pour chicken broth into your largest Dutch oven or stock pot. This one really wasn’t large enough. I should have used my 7-quart Le Cruset Dutch oven. Add diced onion, leeks, celery, yellow and green bell peppers and sliced carrots. Cover with lid and simmer until veggies are tender–about 20-30 minutes. Meanwhile, prepare sauce. Melt butter in a separate saucepan. Add gluten free flour. (You can also use regular flour, if desired). Stir in half-and-half about 1/4 cup at a time until all of the cream is incorporated. Stir to combine and heat through until thick. Add salt, pepper and fresh parsley. I used pink Himalayan sea salt. Stir again to combine. Allow the sauce to get thick, then set aside until veggies are done in the Dutch oven. Here all the veggies have cooked until tender. Heat through another 5 minutes or so. 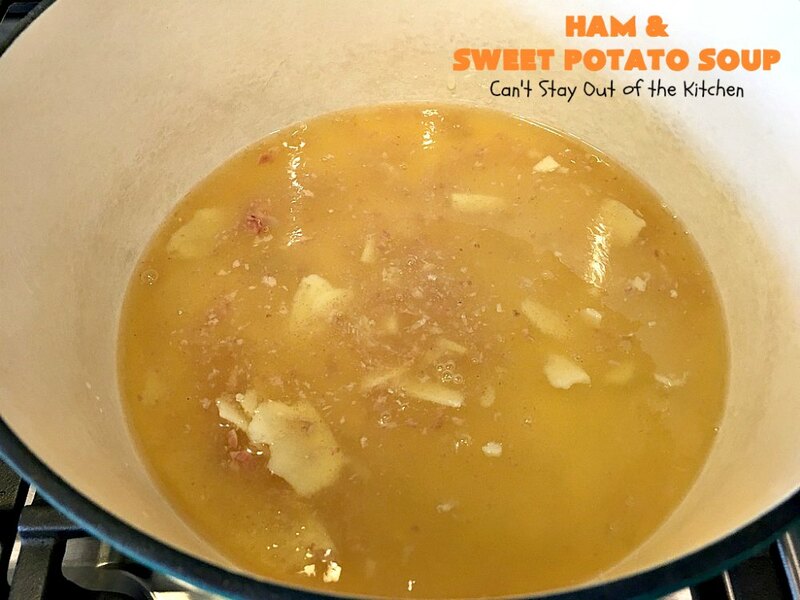 Ham and Sweet Potato Soup is seasoned so minimally but it tastes so wonderfully. 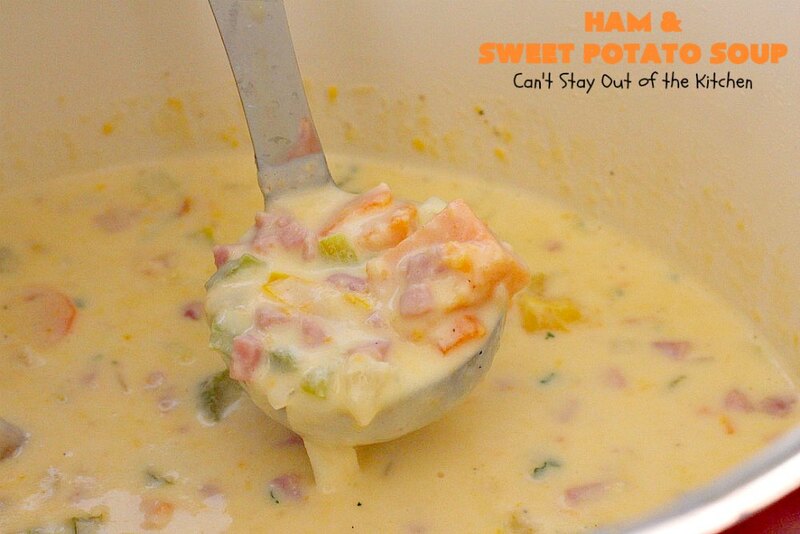 Ham and Sweet Potato Soup is a great recipe to use up garden produce, too. 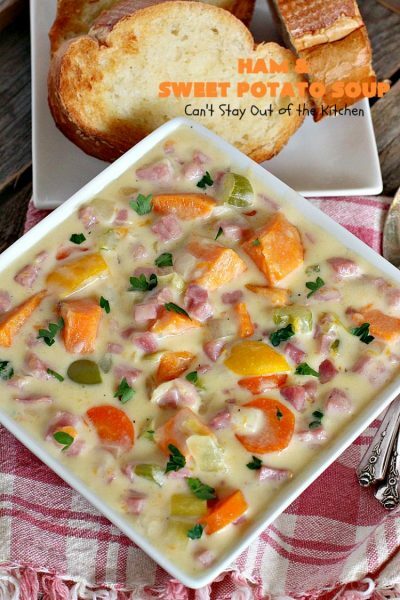 This is a spectacular savory and delicious ham, cheese, and sweet potato soup. 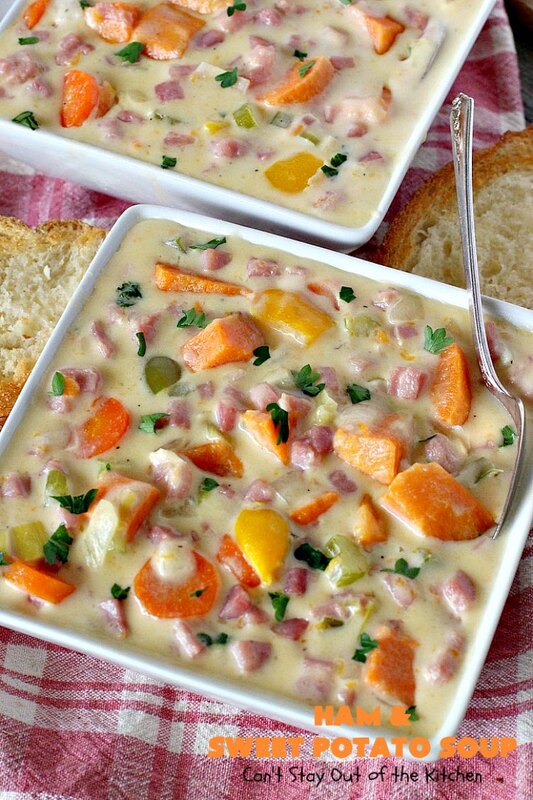 It's chocked full of veggies and perfect for cold, winter nights. Gluten free. Pour chicken broth into a large Dutch oven. Add onion, leek, celery, carrots, sweet potatoes and bell peppers and cook covered with lid over low to medium heat until veggies are tender – about 20-30 minutes. In a separate sauce pan, melt butter. Slowly add half-and-half about ¼ cup at a time until all the half-and-half has been incorporated. 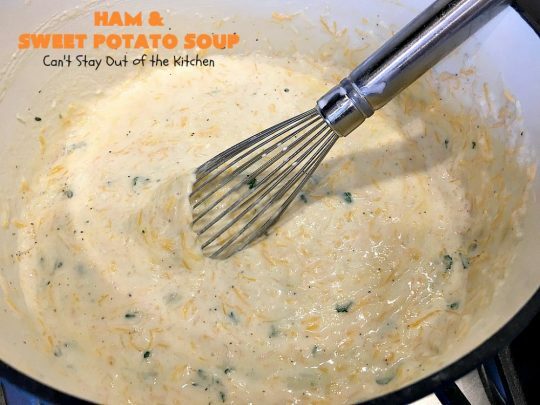 Stir in cheese and allow to thicken. Add parsley, salt and pepper. Stir to combine. Add cheese sauce and ham to veggie/broth mixture. NOTE: I used Monterey Jack cheese because it was what I had on hand. Colby Jack or regular sharp cheddar cheese will work just as well. NOTE: I used vegetable broth the first time I made this and the sauce ended up an ugly brown color. Chicken broth or homemade chicken stock is preferred. 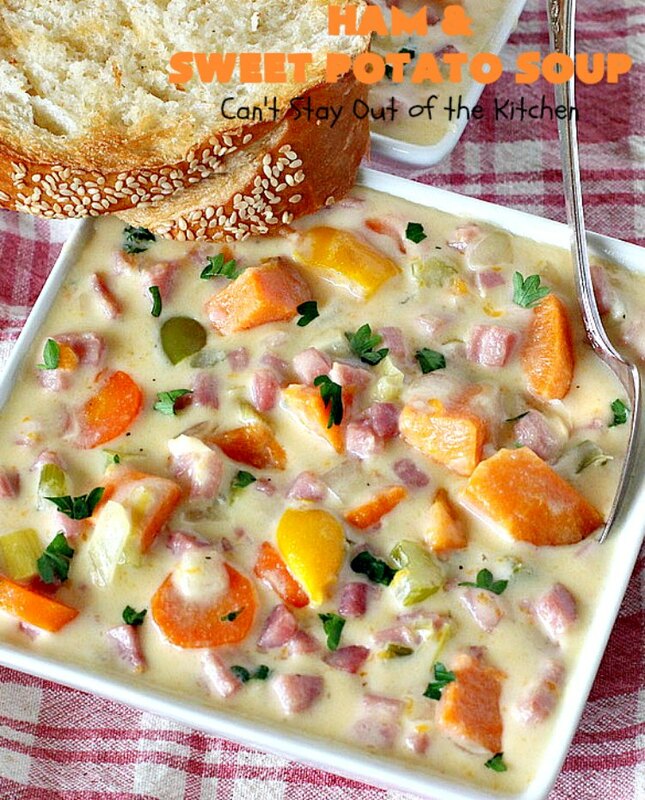 Savory and delicious ham, cheese, and sweet potato soup. This recipe is gluten free. 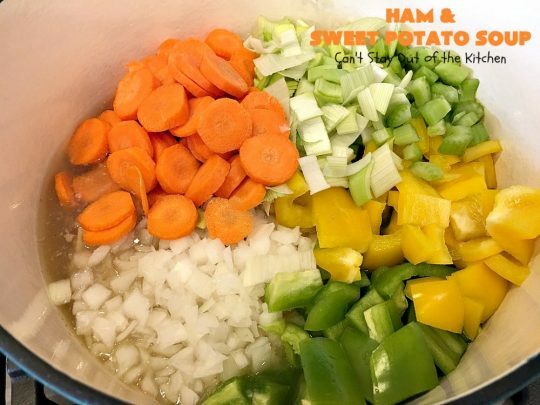 Simmer vegetable and chicken broths with onion, leek, celery, carrots, sweet potatoes, salt and pepper until veggies are tender – about 20-30 minutes. In a separate pan, melt butter. Stir in cheese and parsley and allow to thicken. I used Monterey Jack cheese because it was what I had on hand. 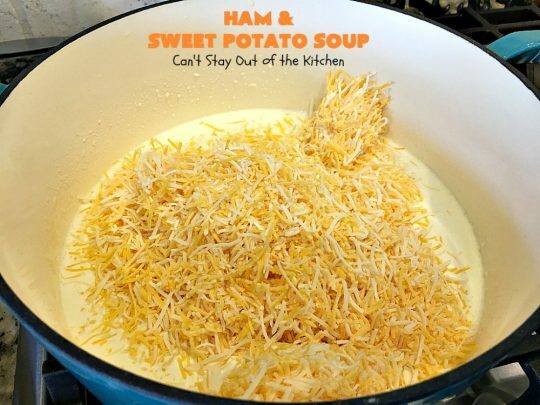 Colby Jack or regular sharp cheddar cheese will work just as well. [br][br]I used both vegetable broth and chicken broth. You can use all vegetable broth or all chicken broth if you prefer. I love eating homemade bread with homemade soup. This close up allows you to see the texture of the soup. Give this recipe a try and see for yourself just how tasty and delicious it is. I wish you could taste it too. 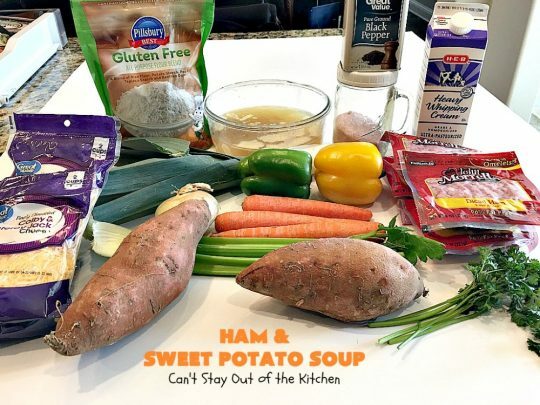 Ham and Sweet Potato Soup is marvelous. Teresa, this looks oh so yummy. Could I do out without the flour? Or would it just not be thick enough? Have you ever used agar agar to thicken? I haven’t, but have heard about it..
Hey, Linda, I have gluten free flour if you want to borrow some to try. It only uses a half cup. I think any thickening agent, even cornstarch would work. 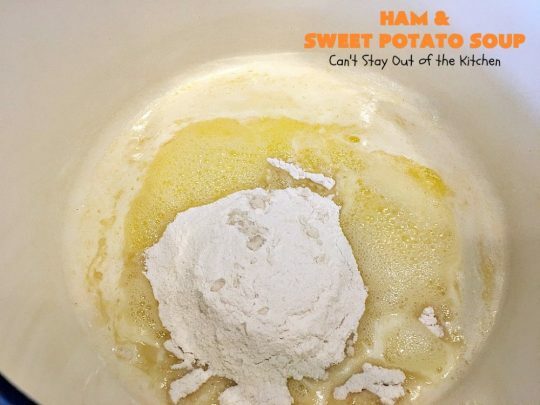 I would not use potato flour as it gets globby.